Black and white 25mm slogan badge. 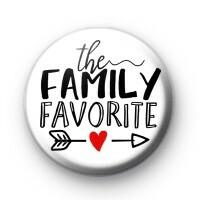 This cheeky badge has the text 'The Family Favourite' written in a script font. It is a great badge if you have siblings and you want to let them know that you're the favourite son/daughter. It is a little fun and a sassy way of joking with your brothers and sisters. I ordered some badges last week, including a custom badge and they arrived within 4 days! Brilliant service.